I’ve been seeing a problem with pagination on certain threads. 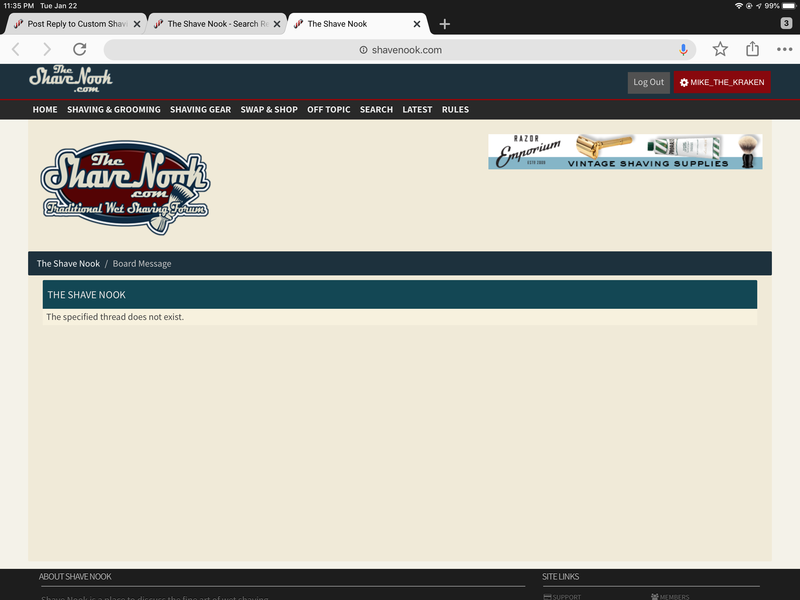 E.G., http://shavenook.com/showthread.php?tid=44692 (M&F appreciation thread) shows as having 13 pages, but if you click on page 13, or surf to page 12 then click the next-page link “>>”, you’ll see a “thread doesn’t exist” error (Try this link: http://shavenook.com/showthread.php?tid=44692&page=13). Generally speaking each page shows 20 posts, but on page 12 of the thread above - there are only 17 posts visible to me, and yet there is a “next-page” button. It’s possible that this occurs when certain posts are hidden from view, but are counted when determining pagination. I generally get this by clicking on “latest” and clicking in the last page of a thread (Like the M&F appreciation thread above). If people keep posting to the thread, eventually it pushes the page count high enough to get pagination working correctly - which makes the problem seem sporadic, but it is predictable. Looks like a bug needs to be logged to the software provider for the forums. Like accurately described above, I have seen the issue 2 times in the last week. I do not recall the problem before these events. Software change or bug or ? Are deleted posts the same as hidden posts ? We have seen this twice in the past week or so. We do not yet know why. To the best of my knowledge there have been no changes to the software, and hidden/removed posts are - again to the best of my knowledge - stripped out before before the thread is broken into pages, so that shouldn't factor into it.